There are still 12 days left until Super Bowl XLVIII and I know, I know…you’re already tired of the will-the-expected-cold-weather-on-Super-Sunday-adversely-impact-Peyton-Manning’s-less-than-zippy-if-bloody-accurate-passes hype. And all the rest of the Super Bowl hype, too. We at GSB are a taking a different, hype-free tack–looking at the Super Bowl combatants, the Denver Broncos and the Seattle Seahawks from a green point of view. What does that mean, you may ask? Read on, hype-weary Green Sports fans, and see who won Green Super Bowl I. For Green Super Bowl I, GreenSportsBlog identified 4 greening categories and awarded points to one or both teams. One team was given more points than the other in each category. All decisions are final–there are no replays/reviews. Got all that? OK, let the Green Super Bowl I begin! 1. WHICH CITY IS GREENER? This hugely important category was challenging to score because of the subjective nature of the question. The good news is both cities rate highly in the many studies and stories ranking the US’ greenest cities. 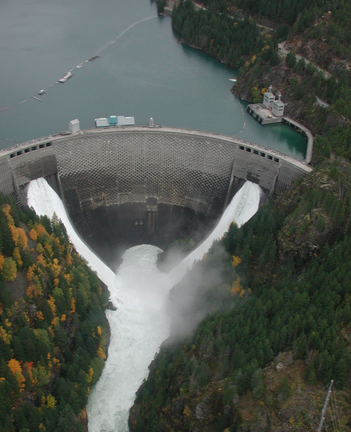 Seattle gets points for generating “over 90 percent of the city’s power in the form of hydroelectricity” and its “two global warming initiatives, Seattle Climate Action Now and Seattle Climate Partnership, [which] have distributed thousands of home energy efficiency kits to residents and urged over 100 local businesses to reduce their greenhouse gas emissions.” (Yahoo, 2012). Denver earns its spot at or near the top of most lists in large part due to its “200 parks within the city limits, 850 miles of dedicated bike trails and 29 recreation centers” (Yahoo, 2012) as well its strong management of its precious water resources. A study by the U.S. and Canada Green City Index and Siemens ranked Seattle #4 and Denver #5, based on a series of 31 qualitative and quantitative metrics, including CO2, energy, land use, buildings, and transport. San Francisco was ranked #1 but they couldn’t get that last TD on Sunday so they’re out of the discussion. Canadian media company Corporate Knights, conducted a similar study, this one based on 38 metrics, slotted Seattle in a 1st place tie with Portland (the Rose City gets a TON of love for Greenest US city in most such surveys) and San Francisco with 35 “green points”. Denver is right behind at 33. Seattle checked in at #3 and Denver at #8 in Yahoo’s Top 10 Greenest US Cities poll. No metrics were provided so perhaps this was more opinion than anything else. A Travel & Leisure reader poll gave Denver (#4) the nod over Seattle (#6), with the Mile High City scoring points for its “most athletic” and “outdoorsy” residents. 2. WHICH STADIUM IS GREENER? Sports Authority Field at Mile High in Denver (2001) and Seattle’s Century Link Stadium (2002) opened in the pre-LEED stadium construction era but the Seahawks (and MLS’ Sounders) owner and Microsoft co-Founder Paul Allen made green building a core part of its stadium’s DNA, as highlighted in this comprehensive Natural Resources Defense Council (NRDC) case study. The Denver Metropolitan Football Stadium District, owner of Mile High, seems not to have made the same commitment. Now, both get points for operating “green-ly”, in terms of recycling, composting, energy efficiency and mass transit access (light rail and bus). And we’ll give Denver a field goal for a strong bicycle access program and another for having a grass field while Century Link’s is artificial. Seattle gets a field goal for having EV Charging Stations and another for on-site solar (yes, solar can work in rainy Seattle). But the deciding factor in giving the Seattle the clear nod is Allen’s commitment to green building. 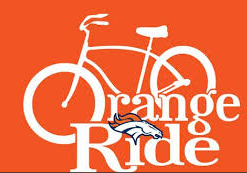 Orange Ride encourages fans to ride bikes to Denver Broncos home games at Sports Authority Field. 3. WHICH SQUAD HAS MORE ECO-ATHLETES? You know what? I like this analogy so much, I’m giving the Broncos a TD on this one! The Seahawks colors are Green & Blue; the Broncos do not have green in their color scheme at all as they feature Orange and Blue. The odds for Super Bowl XLVIII favor Denver and the Peyton Manning Effect ever so slightly–the Broncos are a 2.5 point favorite as of this writing. The Peyton Manning Effect helped the Broncos in the Green Super Bowl I as well, but was not quite enough to overcome Seattle’s strength in terms of being the greener city, playing in the greener stadium and having green in their color scheme. In a well-played contest between teams representing two of the greenest cities in the NFL, Seattle takes the first Green Super Bowl, 32-26. Nice, timely piece. We love how Denver’s SportsAuthority Field put in weather-satellite controlled irrigation and field sensors for ultra-responsible water management and massive savings. But it’s hard to beat Paul Allen’s green sports leadership. Here’s hoping that some of these facts will be highlighted over the next two weeks — it’s certainly a fresh story angle for the major media outlets! Thanks for the comment, Aileen. I’m definitely going to push this story out aggressively :). I should’ve mentioned that Paul Allen also owns the NBA’s Portland Trailblazers and they have been perhaps THE ROLE MODEL for green sports franchises in the US. So you’re right–no one beats Paul Allen in terms of green sports leadership. One of your best posts so far! Let ’em compete for the GREENEST! Thanks Candy for the compliment and for being a loyal reader of GSB!